After my birth, I was immediately rushed to Maine Medical Center for Dr. Mehallic and a great team of people to insert a shunt into my head in order to drain brain fluid. About 15 to 25 percent of the time Spina Bifida comes with Hydrocephalus (which is when fluid builds up in the brain and has nowhere to go) and lucky me I hit the jackpot. The shunt relieves that pressure and allows the fluid to drain into my abdominal cavity where it gets absorbed into my body. This was just the start of many surgeries, about 55 as far as I can remember, and a lot of life spent in hospitals. In my early years, after beating those odds and going home, I would get around by crawling. It wasn't until I was 4 years old that I got my first wheelchair. At the age of 7, I started using reciprocating braces that allowed me to walk with crutches. Unfortunately, the braces mostly worked well inside buildings on even floors but weren't well suited for walking outside. I used them until I was 13 and decided I was a lot more mobile in my wheelchair. I am sure some people might wonder if I regretted that decision, but I actually have never thought I needed to walk. Of course, certain situations would be much easier if I had that ability, but I can't think of any moment that I wasn't able to figure out a way to accomplish something without the use of my legs. At about the same time I made the decision to forego using braces to walk, I met the man that would influence the rest of my life - Bob Dyer. Bob was my Physical Education (Phys. ed.) teacher in junior high school. Unfortunately, he passed away from cancer years ago, but to this day he still has an influence on my life. He was the person that said, "Yes you can". He coaxed me into trying things that I am not sure I would have ever done on my own. Bob took me skiing, both downhill and cross country, got me involved in a wheelchair basketball team. He made it possible for me to ride a 3-wheeled bike with the other kids, and made me participate in all the activities he introduced in our Phys. ed class. I even participated in soccer using my hands to carry the ball while another student pushed me at breakneck speed. It was always the highlight of the class for the person who got picked to push! It was after meeting him that my life became far more adventurous. I suddenly had a need to push my limits and challenge myself. I started wheelchair racing at the age of 15 as part of this need to push myself. I would come home every day from school, as soon as the weather allowed, and and then go the 10 miles back to school. I would do this 20-mile round trip every day of the week if possible. There was a hill about 5 miles into the trip that was super long and steep. It would take me about 16 minutes to get to the top where it started to flatten out again. On the way back, however, it took me about a minute to get to the bottom. I bought a speedometer for my racing chair just to see how fast I could get going down that hill. My record was 56 miles per hour. It was a 25 zone, so I passed 7 cars that day. I managed to do the Maine Marathon 3 times before going to college at 18. I never set any speed records, but I always improved my personal best. At that time there weren't many wheelchair racers, so I would mostly be racing against myself. After entering college my sporting life fizzled out, but I still had the desire to push myself. It wasn't until about 13 years later that I finally got back to skiing and exploring my limits again. I have been skiing ever since and a few years after getting back to it, I joined the race team. That is one of the best decisions I have ever made. Being on the team has enabled me to improve my skiing immensely and has allowed me to travel to other places to ski. I have also had the opportunity to meet people in similar situations in life and gain knowledge and friendships. This past winter I was able to buy my first personal ski and start skiing with friends and family, which has greatly opened up my world in the winter months. Another sport that I recently found is rock climbing. I began climbing in 2013 and it is one of the most challenging and limit pushing things I have ever experienced. I was inspired to try this sport after the passing of a childhood friend, Nick Hall. He lost his life on Mt. 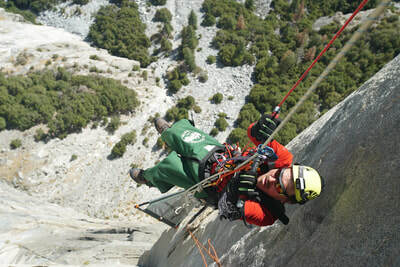 Rainier as a rescue ranger, performing a rescue. When I heard that news I went to his Facebook page and just looked through all the amazing photos he had of places he had climbed, including Rainier. I decided that day I was going to find a way up there to see what he had with my own eyes. I have yet to get there but am now in the process of planning the expedition. 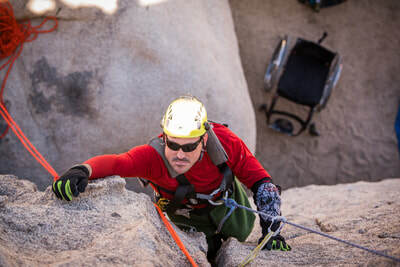 My climbing journey started with finding Paradox Sports, an organization that makes it possible for people of all abilities to experience rock climbing and other human-powered sports. 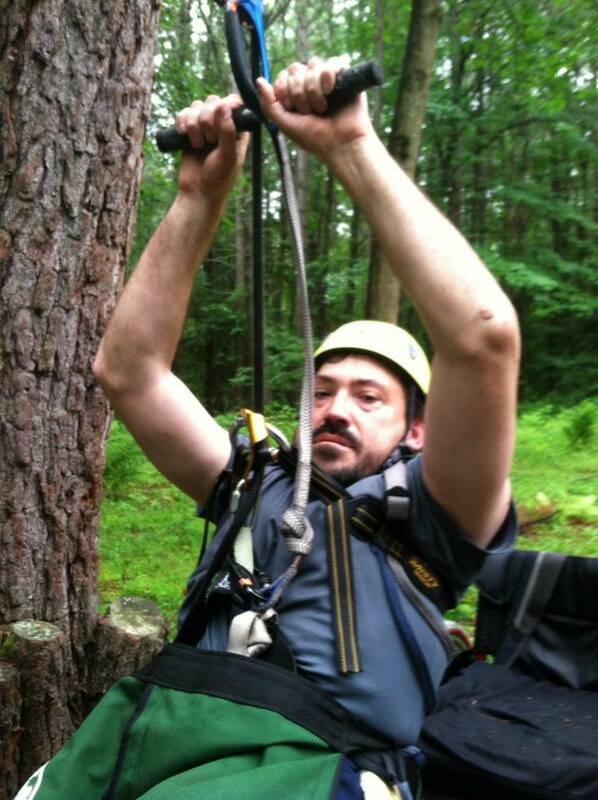 I signed up for their climbing event in "The Gunks" that fall, and the rest is history. I had found the ultimate challenge and was hooked. They showed me various techniques for climbing from a seated position such as using an easy seat with what is called a T-bar ascender. The ascender is just a normal ascender with handles built onto it to allow a person to do pull-ups on a rope that the lead climber fixes. I also have a croll on a full body harness to keep me from sliding back down the rope. There are many technique to climb with varying abilities though and you can learn all of that from Paradox Sports. My first “big” climb was pulled off with the help of my friend Nate McKenzie and others, I was able to be lowered a couple hundred feet down Cathedral Ledge in North Conway NH and climb back out. He asked me why I wanted to do such a thing. I told him it was for the challenge but also the scenery is always better when you are a part of it. I truly believe that going beyond the fence and being part of the scenery is the best way of experiencing nature. Feeling what it's like to see the rock up close, feel the textures of nature, letting it surround you is the ultimate way to allow the natural wonders of this world to affect you in a positive meaningful way. Since then I have climbed almost every year in "The Gunks". 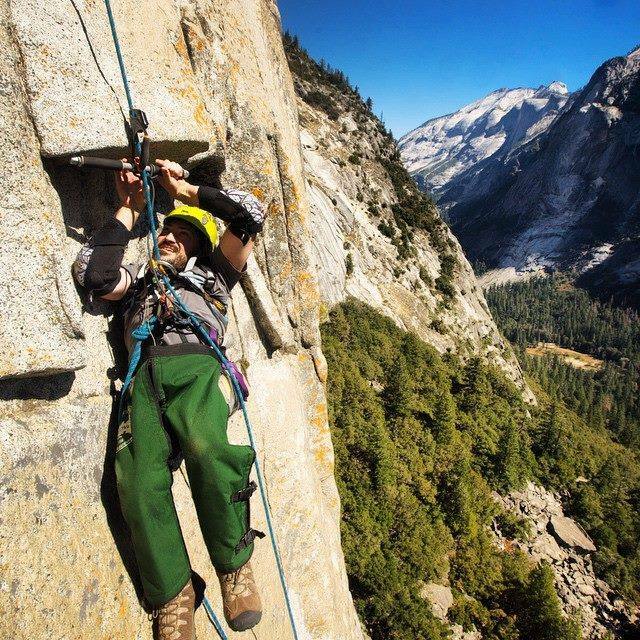 I have also recently climbed El Capitan in Yosemite National Park and had the opportunity to go climbing in Joshua Tree National Park. 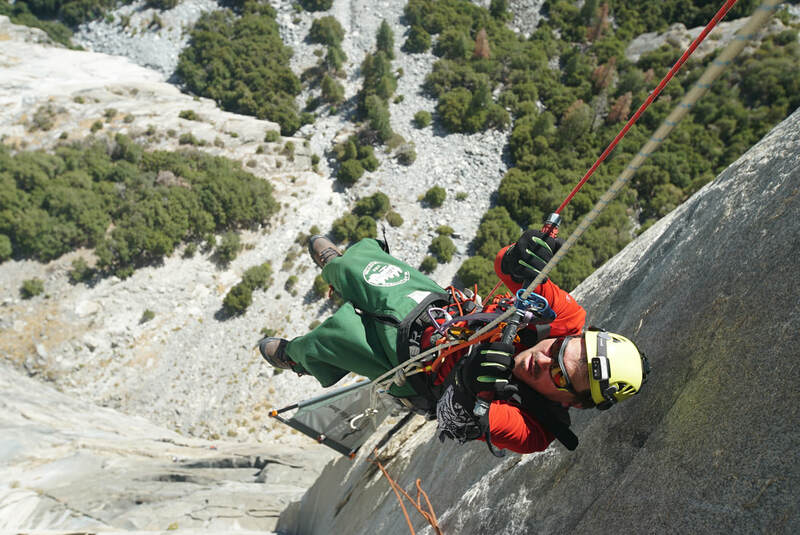 I will talk about El Cap in another post, but I want to point out that it took a huge amount of people to pull that off - 15 to be exact. It is quite an undertaking to climb big walls when you are disabled. You definitely need a group of awesome friends that are all in to do whatever it takes and I, without a doubt, have an amazing group of friends. My hope is that when people see me climb they see that anything is possible and if they just try, things will happen. It may not always be what you want to happen, but you can always try again until it does.